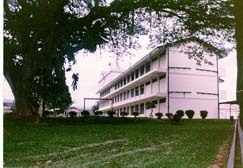 Welcome to the new official web site of the class of 2003 from Malay College Kuala Kangsar. After 2 years, at last, we have decided to renew our web site and move them to Tripod (before this we were using Geocities). In this opportunity, I like to thanks each person who has give their response and suggestions in the past home page. We will keep updating this home page and we will still look for your suggestions in order to improve the quality of this home page. This building has change us a lot. In this place, we have learn a lot of thing.. from positive to negative.. everything is there... There are a lot of sweet and sad memory there.. And we will always keep remeber them. Thank you New Hostel.. We will always remeber the time where will live happily there! !